Organic Garden Fertilizer - Fertilize Often Or Annually? 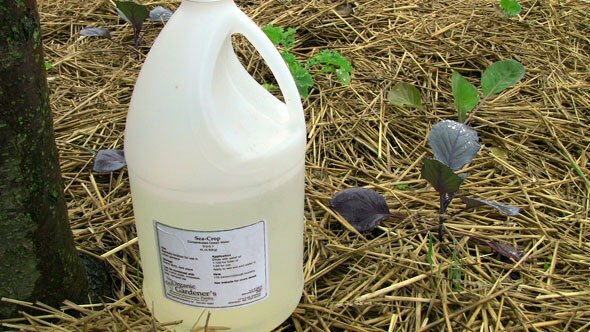 My favorite liquid organic fertilizer is called Sea-Crop. When choosing which organic garden fertilizer to use, sometimes you’ll be choosing organic fertilizers to improve the soil, while sometimes you’ll be feeding plants directly. When feeding plants, I especially use liquid fertilizers such as my 3 favorites – kelp fertilizer, fish and sea minerals – for the broad array of nutrients and other important substances they provide. This article is about feeding plants, and more specifically, it’s about something interesting I’ve learned from various research that’s been done over the years. It turns out that it’s more important for plants to have consistent “nutrient access” to even just a small amount of fertilizer than to apply that fertilizer all at once. I use almost all organic garden fertilizer – which means it’s either derived from something that was once alive or from naturally-mined rocks, and that it doesn’t contain GMOs or toxic additives – but this “nutrient access” rule applies to non-organic fertilizers, too. Studies have shown that if you can give your plant doses of nutrients more often, even at much more diluted ratios (i.e. less fertilizer/more water), your plants will probably be happier than if you gave them a full dose less often. In fact, in one study by Ana Primavesi, plants given 1/50th the regular dose every 2 days grew better than plants given the regular dose every 4 days. They didn’t do as well when given the regular dose every 2 days, nor when given more than the regular dose. I don’t recall if they were using organic fertilizer or chemical fertilizer in that particular test, but the results are useful to us organic gardeners nonetheless. It doesn’t mean you have to fertilize every 2 days, but if you can do it every 2 weeks or even every month, using the lowest dilution rate on the label, that’s going to be better than applying a higher dose every spring and fall. For example, my favorite liquid organic garden fertilizer is sea minerals. It’s just concentrated ocean water, full of over 80 minerals and other bioactive substances. The label says to apply 2-4 gallons/acre for the year. You could probably do this in just 1 application, but more often would be better. I like to do it monthly, at least a few times throughout the year. But in the spring, I’ll even do it weekly when I have time. That will give my plants more consistent access to the nutrients in the fertilizer. Another way you can ensure your plants have more consistent access to nutrients is to improve the organic matter content of your soil with compost and mulches that will be slowly broken down by microbes. Organic matter holds onto nutrients and is composed of nutrients, and through the process of breakdown, these nutrients slowly and consistently become available to plants. It’s the ultimate organic garden fertilizer. Yet another way to ensure consistent access to your organic fertilizer is to improve the health and diversity of your soil food web. Microbes make nutrients more available to plants, so they’re needed for nutrient cycling to work. Compost improves the soil food web, and so do microbial inoculants. Update: About 3 years after I wrote this, I started selling my favorite microbial inoculants and organic fertilizers. You can read more here. What’s your favorite organic garden fertilizer? How often do you apply it? Let me know below. I’ve been using a liquid kelp for 20 years and it really seems to give plants a boost in the spring. I usually apply it just twice, only in the spring, but I’ll experiment with doing it more throughout the year after reading this. Thanks. Can I just go to the ocean collect water dilute and put on vegetables and flowers? Absolutely. If my memory serves me correctly, you can actually use 1 cup persquare foot of soil. If you want to put it directly on your plants, I woulddilute it with perhaps 50 parts water and test a small area first. My favorite fertilizer is a mixture of :1 gallon of cottonseed meal1 cup bone meal1 cup blood mealthis is applied at the rate of 1 cup per 20 foot row at planting time and then a second time without the blood meal at blooming time as a side dressing … I spray the leaves every week with 1/4 strength kelp solution and fish emulsion mixed together. This has worked wonderful for tomatoes, eggplant, peppers and squash… I experimented this year using it on sweet potatoes without the bloodmeal and on russets with the blood meal and so far I’m having the best vines and plants as I’ve ever had. A side benefit has been no disease this year so far, which has been a suprise to me. I’ve only been totally organic for five years now using no chemicals, and using horse manure and compost every winter a month before planting time. I am just now beginning to trust totally organic gardening and have found what you said in this article is correct .. 5 years ago I would have argued with you … LOL!Keep the great articles coming, I learn so much and feel like my family is eating healthier. Thanks for the detailed info – that all sounds great. I tend to stay wayfrom most seed meals now because they’re mostly genetically modified and I’mconcerned about that, and to be honest, I stay away from the blood and bonemeals because of potential spread of the prions associated with mad cowdisease. Both of these topics are controversial, but I like to use theprecautionary principle and go with products I feel better about such askelp and sea minerals. It sounds like it’s working great for you, which isawesome, but that’s just something to consider. I have always foliar sprayed with seaweed, but heard that it was more of a tonic than a fertilizer. This year I have been adding fish emulsion to the mix, and actually doing it weaker and more often and I agree with you the plants are very healthy. I am looking for fulvic acid to add as I understand this frees up nutrients for the plants. I also have to keep spraying with garlic chili spray to deter pests. I often collect seaweed and put it into the compost as an activator and directly as mulch around the asparagus. Some people say that adds too much salt, but you seem to be saying that adds minerals so I will continue to do that unless I notice a detrimental effect. Everything you’re doing sounds great. Thanks for letting us know. There’s noproblem with salt on seaweed at all. The only thing I would be careful of isspraying too much garlic chili, because it harms the beneficial insects,too, plus some plants and microbes probably aren’t especially fond of it. We have so many pests though – help! what else can I spray with to deter pests? At the moment I have found out that trying to grow silver beet or bok choy is a waste of time – they get eaten up before they are a couple of inches high. I am now only growing the crops that the bugs dont like…. If you have pests, spraying your garlic is okay in the short term. Idefinitely understand how you want to keep your plants alive. But it’simportant to remember than pests are just a symptom, an indication that theplants being attacked are unhealthy. They could be unhealthy for manyreasons, and one of the main focuses of my book is how to create plants thatare so healthy that they don’t get attacked. Even then, once in awhileyou’ll have started with sick plants from a garden centre or sub-par seed orany number of issues that may warrant a short term spray, but just rememberto think about creating health in the long run. I’m getting hooked on organic, at my great age (75 this October)…… So much to learn though, wow. My dad is operating a cafe and he makes soy bean milk for sale. So I get the soy dregs for fertilizing my soil. Normally I will bury the soy dregs for 2 weeks before I plant the vegetable. I also made liquid fertilizer with the soy dregs before but it was really stink…. Just a quick question about your 43 ml weekly application. How much water are you adding to the 43 ml of solution? Also, how did this weekly feed work for you last year? Yes, the weekly feed seemed to work nicely. I didn’t have a test group and control group though. I used a hose end sprayer, so it was easy to get a 1:200 ratio, but 1:100 would be fine (4300 ml of water). Three high quality organic fertilisers well established in the professional sector, are now available to the serious hobbyist. go to Organic Fertilisers . As well as a general purpose 7:7:10 feed, MICROLIFE and RECLAIM contain powerful beneficial microorganisms to improve soil health. RECLAIM can be used on turf to help eradicate moss and thatch. Thanks for the suggestion, but I can’t say I’m a fan of these. I don’t love most of the ingredients and it’s a mistake to apply 6:2:20 or 7:7:10 for good measure without knowing you need NPK in those proportions, which most soils won’t. Over time this much potassium in relation to phosphorus can cause some serious compaction issues as well as various plant health problems. There’s no such thing as a high NPK all purpose fertilizer. The Microlife product is a little better. It all depends on your soil. That’s why I recommend soil testing through an organic soil lab, and they’ll help you decide which fertilizers you need. For example, gypsum may be called for, but it may be detrimental. The only fertilizers I recommend for use without a soil test are broad spectrum rock dusts, and then biostimulants such as ocean water and liquid kelp.